The brand new seafront apartment is situated in a former fishing village Komarna, 70km north of Dubrovnik. Apartment is perfectly located, right at the seafront. Apartment is air-conditioned. Inside the apartment, there is a large bedroom with a double bed, open-plan living room, fully equipped kitchen and bathroom. 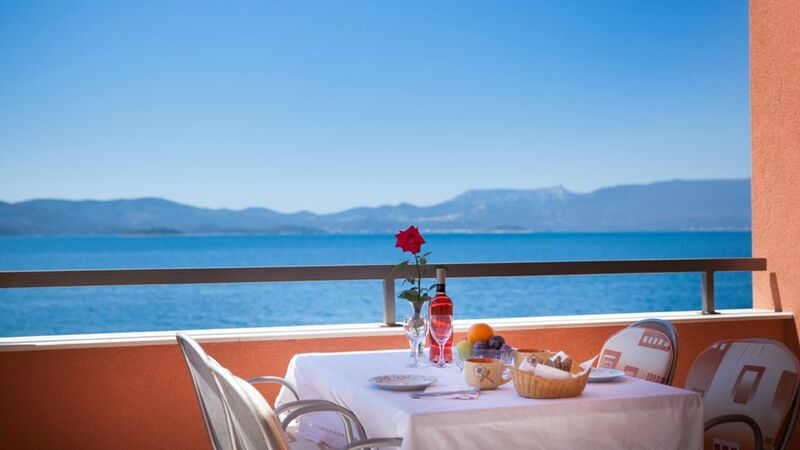 This lovely seafront apartment has large balcony overlooking the sea, small islands and the Peljesac peninsula. Enjoy this stunning view while dinning al fresco. There is an additional sofa bed in the living room. WiFi, parking and a washing machine are all available and included in the price. Komarna is an ideal place for a quiet and relaxing vacation. The swimming in the crystal clear sea waters is delightful experience. For those who just want to kick back and take in the sights, sunsets, watched from the balcony, are not to be missed. For those wanting to explore the area while on vacation, there are many sightseeing spots. Embark on a Neretva river safari from the village Vid, only 3 0km from Komarna and don't forget to taste the local specialties, like frogs and eels. Direct flights from UK and Ireland: During the April-October period, there are direct flights to Dubrovnik from Gatwick, Manchester, Southampton, Edinburgh, Leeds Bradford, Belfast, Birmingham and Dublin Airports (among other European airports). Activities in Komarna: The sea is the must while on vacation in Komarna. The water is crystal clear, and it is just 20 stairs away from the apartment. Komarna is also the place for hiking holiday. The surrounding mountains are full of small roads, all of them open to the public. There are many small deserted villages in the hills. There is a indoor swimming pool and fitness centre in the village and these facilities can be used for a small daily fee. There is a children playground, and a small sport ground where one can play a game of soccer or basketball, as well as petanque. Sightseeing - highly recommended: Komarna is a great base for sightseeing. There are great places to visit in the surrounding area and we highly recommend it. Dubrovnik, Ston, island of Korcula, Peljesac peninsula, Source of river Buna (Blagaj), Mostar, Kravica Waterfalls, Roman town of Narona, Delta of river Neretva, and many, many more. We will be very pleased to guide you around or help you with advice where to go. Hi, we are Mile & Jasa, the owners of Villa Dorida. We are both in our early 60s. We have four grown-up daughters, and three grandchildren. In our leisure time we like fishing, cooking, tending our small olive grove, and spending time with family. We live on site, know the area in and out, and are happy to share all our tips with you. We are happy to answer all your questions about the region, and to do our best in order to make your stay as pleasant as possible. Feel free to contact us. Communal pool is provided in a building next to ours. Fees apply. Towels and linen are provided and changed weekly. Apartment is air conditioned. Hair dryer provided. I cannot recommend this place highly enough. We stayed for five days at the end of July. Our hosts Mile and Jasminka were lovely and welcoming. There was food in the fridge when we arrived and they even brought us some fresh fruit on the beach the next day. The apartment has a balcony overlooking the sea, and it’s just a few steps down to the beach. It’s also kitted out with loungers, parasols and lilos. We had no problem with the pebble beach and the water is crystal clear and calm. The Komarna resort itself is small but has everything you need – café bars, a restaurant, well-stocked shop. If you want a relaxed few days there’s no need to venture far. We hired a car from Dubrovnik airport. There’s a coast road from the airport right to Komarna so it’s a simple 1.5 hour drive. Don’t forget to keep your passports handy as you drive through Bosnia about 20 mins before you get to the apartment and you have to stop at both borders. Mile and Jasminka recommended some lovely places to eat. Highlights included taking a boat across the water to a beautiful secluded restaurant overlooking the bay, and also some delicious home-cooked seafood that we ate on the balcony of a local lady’s house (she also serves food to your apartment if you prefer). If you’re thinking of booking this place then do it. You will not be disappointed. Lovely peaceful setting with very generous hosts happy to do their best to ensure guests have a pleasant stay. Apartment was clean, spacious with everything you could possibly need. The balcony overlooked the beach area with great views of the islands beyond. Jasminka and Mile delightful hosts! No hesitation in recommending this place! We were impressed by the nice location for a relaxing holiday. Enjoyed the sea view from our own terrace and the warm atmosphere created by the owner Vera. Apartment was nice and clean and all our wishes/questions were taken care without delay. We left with warm feelings and certainly would recommend Villa Dorida to anybody willing to slow down and relax. A wonderful place to stay with hosts who went above and beyond to make us feel welcomed. If you are looking for a holiday which is relaxing then Komarna is the place to go. We watched turtles swimming past from our balcony. We never tired of listening to the sound of the waves on the stones. With a hire car it is easy to visit all the top sites. The apartment was clean and comfortable and Mile and Jasminka provided us with a fridge full of food upon our arrival. A 5 star apartment with 5 star hosts. We would definitely go back. Great place, very friendly and helpful owners. Central to get to Dubrovnik, Split, Split, Mljet and Korcula in one trip. In a very quiet town right on the beach, we visited out of season and we practically had the place to ourselves. Would highly recommend this place and will stay again when we go back. you could possibly need and the landlords were sweet enough to have food and drinks available to us when we arrived. They had a wealth of knowledge on the surrounding area and were able to provide helpful advice on what we should see/do in the area. I am recommending this apartment to all my friends and would love to one day return to the beautiful village of Komarna! Minimum stay - Season A & B: 2 nights; season C: 3 nights; season D: 4 nights; season E, F, G: 5 nights You should arrange your own cancellation & travel insurance.